The power consumption levels have reached towering heights over the years because of increasing usage in the commercial and real estate sectors. To add to this, the frequent power cuts affect the productivity of organizations and the electricity bills also shoot up beyond estimated budgets because of the use of generators and other external local grid mediums. Solar Power is a smart way to reduce the power costs and also helps businesses produce their own power. This will help a great deal without having to depend on the external artificial techniques that increase the overhead charges. We at JAYRAJ SOLAR have specialized Solar EPC modules and have created high quality Roof-Top PV systems starting from 5kWp capacity and higher versions that can be put to use for customer “Captive” purpose and can also be exported back to the grid “Net- Metering” model. The main purpose is to provide the most effective solar energy solution depending on the exact requirement of different businesses. JAYRAJ SOLAR is highly proactive in manufacturing the most effective solar power solutions and the Grid-Tie System is one among the most popular ones that we install. The unique feature is that this system is operative during the Solar Window time period that is 8AM to 5PM. This ensures the smooth functioning of the various day-time power dependent processes for business enterprises. In this way, the dependency on the unsteady local grid and costly diesel generators can be avoided and this helps in creating an eco-friendly environment as well. Our solutions are tailor-made so as to fulfill the exact solar power requirements of our clients based on the existing power demand and recourses in their enterprise. We have the best team on board who take care of every technical detail with respect to the installation process in the solar power plant and maintain the optimum size so that 100% of produced power goes for “Captive” consumption. This will in turn lead to zero wastage and help gain maximum return on investment. JAYRAJ SOLAR Roof-top systems offer seamless integration in line with the existing energy infrastructure (local grid, Diesel GenSet, other Hybrid Power plants), in order to expand the scope of the customer energy sources. During the cloudy, bad weather, lower irradiance, force majeure events on certain days when our solar system are operating below optimal capacity, we have techniques where power will be sourced from the other energy for un-interrupted supply of power to the business units. The main aim of the Grid-Tie systems is not only power generation but this contributes towards removing the day-time diesel usage and reduction of monthly electricity bills. The Grid-Tie system is very beneficial for business concerns like Educational Institutes and Banks where the power consumption is highly imperative during the day time. JAYRAJ SOLAR’s Off-Grid PV system are gaining a lot of demand these days and is one of our most successful products as it provides increased choices and flexibility resulting in increasing level of reliability of deployments. Off-Grid systems are most commonly used for customers whose business operations are highly active round-the-clock. These include hospitals, hotels, manufacturing industries and those specific places such as poultry farms, hatcheries and resorts etc. with limited/highly unsteady grid supply where uninterrupted power is a must. 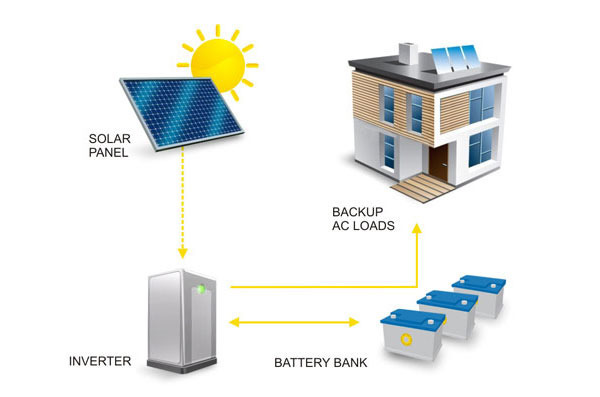 Our Off-Grid PV Systems use a “battery bank” where solar power produced during the day can be stored for future usage. System sizing are customized according to individual customer needs depending on electrical load and back up requirements. It is after this analysis that the system sizes and battery size are designed. 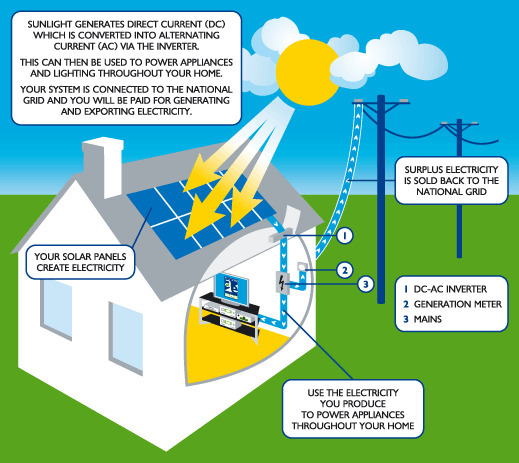 Thus Off-Grid PV systems can be designed so as to operate either as a source of power back up during power cuts or as total off-grid systems whose power needs are solar dependent. JAYRAJ SOLAR’s Off-Grid systems are synched with the existing grid/DG systems keeping the focus on the system produced solar power as the primary source of power. When there is inadequate or nil solar generation, power stored from the batteries is consumed and only after the batteries are fully discharged, does the Off-Grid system connect to the respective Grid/Diesel Genset sources. Net-Metering is an interesting module in JAYRAJ SOLAR’s Solar system solutions. Net-Metering is the difference between the excess energy (kWh) you have generated and fed into the grid with your solar PV system and the kWh’s you have purchased from the Grid. Within the pre-defined PV system size and connection restriction, Net-Metering is allowed across 25 Indian states and union territories (draft and approved) for Rooftop Solar installations. These systems can be helpful for those business establishments which have very minimal power usage (compared to system size) during week-ends/holidays such as Schools & IT Companies etc. In the case when excess solar power generated during these recess times, the same is “Exported” to the grid and is offset against the regular monthly electricity bills. You can Contact Us to know if your facility is eligible for net metering and for more information on various Net Metering scheme across India.